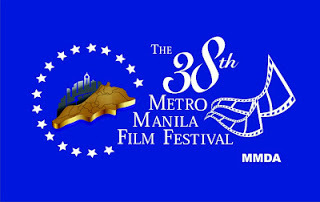 The winners of the 38th Metro Manila Film Festival (MMFF 2012) were revealed Thursday night, December 27, 2012, during its Gabi ng Parangal (Awards Night) at the Meralco Theater in Pasig City. Best Child Star: Miguel Vergara, "One More Try"
Best Sound: Michael Idioma, "El Presidente"
Best Musical Score: Jessie Lazatin, "El Presidente"
Best Theme Song: apl.de.ap and Jamir Garcia, "El Presidente"
Best Make-up: Warren Munar, "El Presidente" by Warren Munar and company. Best Editing: Vito Kahili, "One More Try"
Best Cinematography: Odyssey Flores, "Thy Womb"
Best Supporting Actor: Cesar Montano, "El Presidente"
Best Supporting Actress: Wilma Doesnt, "Sisterakas"
Best Original Story: Henry Burgos, "Thy Womb"
Best Screenplay: Anna Ramos, "One More Try"
Best Director: Brillante Mendoza, "Thy Womb"
Gender Sensitivity Special Award: "Thy Womb"
Gatpuno Villegas Award: "Thy Womb"
2nd Best Picture: "El Presidente"
Best Actor: Dingdong Dantes, "One More Try"
Best Actor: Alan Paule, "Gayak"
Best Actress: Liza Diño, "In Nomine Matris"
Best Director: Tyrone Acierto, "The Grave Bandits"
Best Film: Tyrone Acierto's "The Grave Bandits." Special Jury Prize: Armando "Bing" Lao's "Ad Ignorantiam"
Gender Sensitivity Special Award: "In Nomine Matris"
These movie contenders are currently showing on theaters nationwide and the tally is currently spiraling up as more and more moviegoers are out for their holiday movie trip. Let us support the Phillipine movies! Also watch the late telecast of the 38th MMFF Award's Night on TV5 tonight at 9:30 PM.